This year marks the 10th anniversary of Enchanted Airlie! 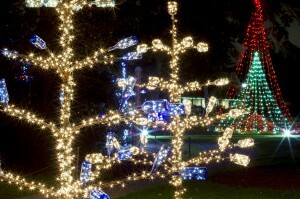 Come out and enjoy a 0.5 mile stroll through the Gardens while feasting your eyes on a spectacular array of lights and holiday displays. There are two run times each evening: 5-7pm and 7-9pm. Tickets must be purchased in advance and sell out quickly so get yours today!